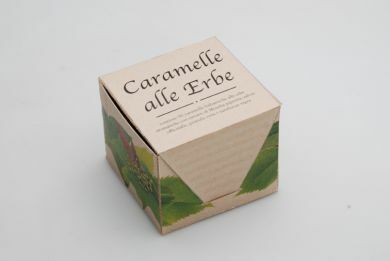 Packaging for herbs candies ("caramelle alle erbe" in Italian). The solution was developed starting from the analysis of the product characteristics:in particular the fact that these candies are sticky and they paste themselves one on another. The container, economical and essential in its cubical form, was then designed inserting four thin paper sheets, glossy and opportunely folded, which keep separated the rows of candies. The form and the surface treatments of the opening system elements help, visually and tactilely, the user in accessing to the product. Besides, the "milling" effect on the surface also reminds the candies aspects.